Arnskar Ember-Master is a Nord blacksmith in the Ragged Flagon in Riften. He moves into the area after the player completes three special high-profile jobs for Delvin Mallory. Despite his connection with the Thieves Guild, he is not a fence. He sells weapons and armor as well as the materials to make them. He focuses mostly on melee weapons over bows or armor and carries 1000 gold which is replenished daily. There is a usable grindstone, workbench and forge, as well as a counter with a few stealable weapons inside his shop. Arnskar spends all his time serving his store he has set up in the Ragged Flagon. He will spend much of his time working at the various facilities inside his shop. However, he will occasionally take a break and just stand around or will sit down and dip his feet in the water to cool off. 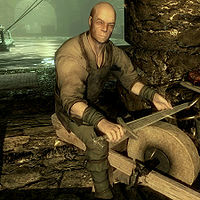 The only time he will not offer you his services is when you have offended the Thieves Guild by breaking one of their rules. He will not offer you his services until you have completed the Reparations quest to get back on good terms with the Guild. Arnskar wears a blacksmith's apron along with a pair of shoes. He carries around a leveled war axe, which can be up to Elven in quality, and a small amount of gold. Arnskar thinks very highly of his abilities and will point out that he earned his title: "They don't call me the Ember-Master for nothing. What do you need?" He will continue to point out his skills: "Looking for the best smith in Skyrim? You found it." He will then stop talking about himself and discuss his wares: "Need your weapon repaired? Or could I interest you in a new one?" When you have offended the guild, he will not want your business and will only remark: "You're in it deep... better start shoveling your way out." This is the merchandise found in Arnskar's merchant chest. These items are only available if purchased from the merchant; they cannot be pickpocketed or stolen. They are restocked every two days. This page was last modified on 22 May 2013, at 02:31.